On the last track we discussed daily self monitoring diaries. On this track we will discuss developing a controlled treatment plan. We’ll discuss when to use controlled treatment and two steps to developing a controlled treatment plan. The two steps are establishing a peer group of counselors and making problem gamblers aware of peer counselors as a resource. First, let’s discuss when to use controlled treatment. Do you find that while abstinence is a worthy goal for some pathological gamblers, it may not be the best solution for every client? For a large percentage of the pathological gambling and problem gambling population, controlled gambling may be a viable option for treatment and a good way to measure the relative success of psychological and medical intervention. I find that despite the best treatment, some pathological gamblers are going to do what they ultimately want. Therefore, would you agree that by making abstinence each client’s goal, we short change them of the relative level of success possible through treatment? Perhaps if we can teach clients to at least have a greater sense of control over their lives, then they may have taken productive steps toward dealing with the problem. Think of your client. Could he or she benefit more from a treatment plan with the goal of living without gambling or from a controlled treatment plan? Next let’s examine step one, establishing a group of peer counselors. One problem that often comes up in treatments using active participants is how to harness the gambler’s talent in a structured program. To achieve this, you might consider transferring informal and implicit skills to a formal regimen. Therefore, one of the first steps is to establish a group of controlled gamblers who are willing to share their coping skills. The gamblers who are trying to control rather than abstain would suggest help to develop appropriate gaming money management strategies. In such a program the therapist then serves as more of a consultant and teacher. 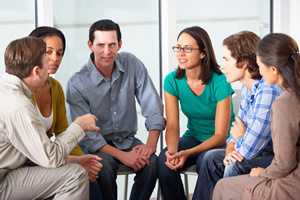 Initially, the peer counselor or group, for example suggests appropriate gaming strategies. If the gambler agrees to try the new strategy, the therapist then facilitates its implementation in the real world of gambling. For example, one peer counselor, Larry, suggested an effective strategy for moderating gambling. Larry, age 52, stated to one of my clients, "There’s two steps to slowing down your gambling. --Step 1: First, you can make your money go farther by placing smaller bets. You won’t win as much, but you also don’t lose as much when you lose. And we all know you’re going to lose more than you win." Think of your client. How might he or she benefit from placing smaller bets? Might your gambling client notice little or no difference in final money loss on an average? Larry continued to explain his strategy for moderating or controlled gambling. --Step 2: Larry stated, "The second step is allowing some time to pass between games. If you can find something else to do, even for just five or ten minutes between card games or races, you’ll lose a lot less money." Could alternative activities between bets help your client begin to moderate or control his or her gambling? Finally, let’s discuss the second step regarding developing a controlled treatment plan, which is making pathological gamblers aware of peer counselors as a resource. If clients are classified as appropriate candidates for a controlled gambling regimen, they could undertake a reappraisal of their inappropriate gambling patterns. Peer counselors who participate in the same gambling game a the client would be especially helpful in this process, because they are familiar with specific strategies applicable to their mutual activity. As you know, most gamblers specialize by concentrating their efforts upon one gaming activity. Taking stock of gaming strategies can be done with reference to self control techniques such as keeping precise records of daily wagers, specifying exactly how winnings are to be distributed, and establishing a precise unit of wager. Also, peer counselors can fulfill the position of client monitoring. Stephanie was the peer counselor assigned to Monica. Monica, age 32, had a problem with playing the lottery. Stephanie’s previous gambling problem also centered on the lottery. Stephanie monitored Monica’s gambling habits over several weeks as the two talked in group therapy sessions. Stephanie encouraged Monica to write down the amount she spent on lottery ticket purchases, as well as what she purchased with the tickets, and the time of day. Stephanie later helped Monica conclude that Monica was purchasing more lotto tickets on her way home from work than any other time. Therefore Monica began restricting her purchases to mornings and trips to the grocery store. Think of your Monica. How might client monitoring by a peer counselor benefit your client? On this track we discussed developing a controlled treatment plan. We discussed when to use controlled treatment and two steps to developing a controlled treatment plan. The two steps are establishing a peer group of counselors and making problem gamblers aware of peer counselors as a resource. On the next track we will discuss exposure to gambling. We’ll examine five methods of avoiding exposure to gambling. These will include self exclusion, being near a gambling establishment, being in a gambling establishment, being alone in a gambling establishment, and receiving an invitation to gamble. What are two steps to developing a controlled treatment plan? To select and enter your answer go toCEU Answer Booklet.